A new study published in The BMJ suggests that those who eat spicy food on a regular basis could lower their risk of death from cancer, ischemic heart disease, and respiratory disease, thus potentially increasing their life span. In order to conduct this study, researchers from the Chinese Academy of Medical Sciences analyzed data from the China Kadoorie Biobank, which was a prospective cohort study of approximately half a million adults from different geographic areas in China. The study looked at 487,375 adults between 30 and 79. The study, which began in 2004, required each participant to complete a questionnaire about their health and consumption of spicy food, red meat, vegetables, and alcohol. These participants did not have cancer, heart disease, or respiratory disease at the outset of the study and they were regularly assessed for illnesses throughout. In 2008, five percent of the remaining participants were surveyed again to see if their spicy food consumption had changed over time, but overall it was consistent. A total of 20,224 of the participants were reported to have died during the study period. Results from the study showed that participants who ate spicy foods three to seven times weekly were 14% less likely to have died than the participants who did so less than once a week. Study subjects who consumed spicy foods once or twice a week reduced their chances of death by 10%, compared to those who ate them less than once weekly. The researchers found that study participants who added fresh chili to their food on a regular basis had reduced risk of death from cancer, ischemic heart disease, and diabetes. More research on whether spicy foods can truly increase life expectancy is being called for. Jun Lv, et al., “Consumption of spicy foods and total and cause specific mortality: population based cohort study,” The BMJ, published online August 2015; http://press.psprings.co.uk/bmj/august/spicyfoodres.pdf. 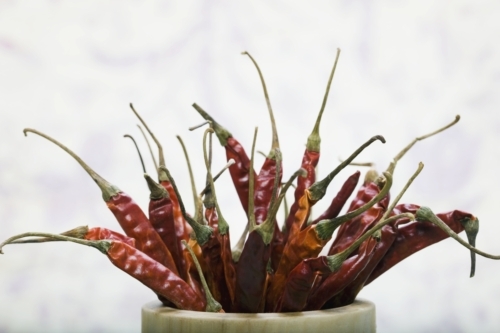 McIntosh, J., “Eating spicy foods may extend lifespan,” August 5, 2015; http://www.medicalnewstoday.com/articles/297670.php.